As part of the "Getting Around" competition of the 2005 Solar Decathlon, each team is given a Global Electric Motorcars e4 electric vehicle. For the 2005 Solar Decathlon, teams must design their houses to produce as much excess electricity as possible. This excess electricity will be used to charge each team's e4. Teams earn mileage credits each day depending how far they drive their e4, so a good showing in the Getting Around competition can significantly impact a team's overall score and final standing in the competition. 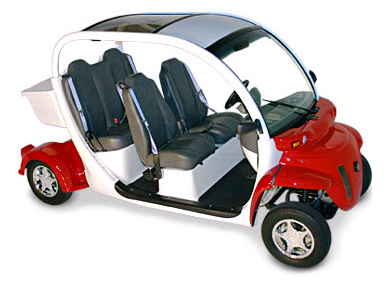 The GEM e4 is a four-passenger battery-powered vehicle that is street-legal on roads with a speed limit of 35 miles per hour or less. The e4 has two user-selectable ranges that allow it to travel at speeds in excess of 25 miles per hour for approximately 30 miles. The e4 is all-electric and produces no emissions. Power is delivered to the front wheels via a 72-volt General Electric shunt motor. Energy is stored in 6 Trojan 12 volt deep-cycle batteries, housed under the rear passenger seat. Charging is accomplished through a standard 120-volt household receptacle. The Maryland team also plans to install a battery monitoring system. This system will enable the team to effectively monitor electricity usage under different driving conditions and maximize the e4's mileage. After the competition, the team will donate the e4 to University of Maryland Facilities Management. The e4 will be used by grounds crews to maintain the College Park campus. For more information on the e4, please visit the GEM website at www.gemcar.com.